Personal Accounting can be considered as a branch or sub-division of accounting , essentially for managing the personal finances of an individual or household. Also known for example as Home Accounting or Domestic Accounting, it is usually supported and implemented on accounting software by the use of both commercial and shareware off-the-shelf accounting software packages, for use on home PCs. The majority of software available in support of personal accounting does not support double-entry bookkeeping or the double-entry system. The accounting model upon which the standard system of accounting is based, used by businesses to record and report financial activity, is generally thought too complex and too difficult to use for home accounting. Single entry accounting is most often used today in support of most personal accounting. Single entry, typified by the use of a journal , is the most common form of entry in a double-entry system. In order to set up and run personal accounts to manage and control personal finances, the only guidelines available are based on business accounting where the focus is on profit, shareholders’ value, purchases, sales, expenses, etc. - hardly relevant to the domestic scenario. Reports like the Trading and the Profit and Loss account are also, equally understandably, not much use in evaluating domestic financial success over some period. Business financial ratios such as Gross and Net Profit Margins, Return on Capital Employed and over twenty other ratios, although vital for management and control in business, have absolutely no bearing on domestic finances. Business accounting has important characteristics evolved over hundreds of years which make it the only (and legally required) way for business finances to be successfully managed. The author extracted the best and most appropriate features of business accounting and adapted and simplified them to make their use feasible and practicable for home use. The thrust of this new accounting model is twofold - Focus and Simplicity - as an easy means for people to use accounting in order to gain and exercise control of their domestic finances. Domestic Well-Being is the new focus for personal accounting and is defined in terms of a structure for the transactions making up the increases and decreases of domestic, financial activity, characterizing daily life. The DWB structure consists at the top level, of the three categories “the Basics”, “the Discretionary” and the catch-all of “Others”, together covering all aspects of domestic finances. Basics essentials” (food and drink, utilities, etc), “responsibilities” (taxes, mortgage, insurance, etc.) and “family” (personal commitments, gifts, etc.). Discretionary – Similarly, the Discretionary category includes asset purchases and sales (e.g. house and car), other sub-categories such as “nice-to-have” (holidays, hobbies, entertainment, etc. ), “investment for the future” (home improvements, pension contributions, etc.) and “luxuries”. Others – The Others category consists of uncontrolled changes such as inheritance, appreciation, depreciation, losses, fines, etc. The power of this structure is that it provides an easy way to categorize all the domestic financial transactions as they occur from day to day, so that they can be periodically entered into the accounts as part of bookkeeping and subsequently be reported in meaningful ways as a basis for analysis and control. See the complete DWB structure in the Domestic Well-Being Statement (DWBS) in #Sample Products. DWBA retains the power and advantages of double entry techniques, primarily to gain a complete and total view of the evolving state of the finances of the target, accounting entity - a single individual or a number of individuals making up a household. The implications of using double entry are that some extra accounts are required to store the total Domestic Wealth of the household and that the accounting system becomes subject to the need for maintaining mathematical balance which can be understood by users through an appreciation of the so-called accounting equation, adapted for domestic use. A new set of Domestic Financial Factors (DFF) are defined to replace business financial ratios. For example, the “Basic Cost of Living Factor” (BCLF) expresses the amount of the basic domestic decrease, compared to total household increases, whilst the "Well-Being Contribution Factor" (WBCF) is the proportion of discretionary domestic decreases, compared to total household increases. See more details under #Sample Products, below. Together, these new factors provide shape to any complete set of domestic accounts and can be used as one of the starting points for analysis for future control, through comparison with previous values leading to the possible need to initiate some changes to future expenditure. A ratio of course provides various means of altering its future value, by changes to its numerator or denominator, or both. These ratios also have future potential over and above their use for control in an individual set of accounts, as a base for new form of domestic financial comparison, by regions and even internationally, across countries. A picture speaks a thousand words is particularly true in the world of numbers and accounting. A growing number of graphical reports have been developed from the model to support analysis of the information accumulated during the bookkeeping phase of DWB accounting - see #Sample Products, below. The fantastic benefit of all of this is the visibility provided, as a basis for analysis, planning and control for the future. The balance across the categories becomes clear and the split amongst the decreases across the different sub-categories, is also exposed. Also associated with DWB as the primary focus for domestic accounting are six, so-called stages of financial life. From this, where there is a significant enough change that may be observed is some aspect of personal finances across the life-time, a pre-defined stage facilitates some form of indicator or measurement that can be useful as another basis for comparison, as part of analysis. The values of certain groupings of the Domestic Financial Factors should have a correlation with the stages of financial life which can be emphasized with the use of 'star' or 'radar' diagrams - see #Sample Products, below. The concept of improved or maximizing Domestic Well-Being is all about achieving a better balance across the components of its structure. This translates into obtaining the best usage of increases received as income, with decreases across both the categories of Essentials and the Nice-to-Haves, as well as between the various subordinate sub-categories within each category. The new focus and target for domestic finances through the use of domestic accounting is to maximize Domestic Well-Being, in contrast to maximizing business profits. In order for the accounting of personal finances to be successfully undertaken by non-accountants, it is paramount that ways be found to make it simple and easy to understand, as well as cost- and time- effective to achieve. An increasing number of software packages to support home and personal finances are now available. However, they tend to fall into two groups - they are either too simple and unsophisticated enough to provide really useful results, or they are modelled on business accounting which as already discussed, has the wrong focus, is inappropriate and is too difficult for most people to understand and implement for the home environment. A number of features have been incorporated into DWB accounting to achieve the required level of simplicity to aid an appropriate understanding of accounting and to help facilitate its implementation. These are based on appropriate terminology as well as involving techniques to highlight certain of the relationships between all the individual accounts needed. As a result, a key feature is a new account naming structure which relates accounts and their interrelationship with one another, through a new and simplified domestic accounting equation. Other mechanisms to help tie together this understanding are reinforcement of the simple mathematical rules associated with maintaining balance within equations; and the accounting rule, of ensuring in double entry that all debit entries must always be balanced by equal amounts, in corresponding credit entries. The practical difficulties experienced by non-accountants are mostly related to a lack of real understanding about the inter-relationships of the debits and credits at the heart of transaction-entry in the double entry system. These debits and credits are associated with the two required postings for each transaction, as they are entered into two particular and appropriate accounts out of the complete set of accounts required in support of the finances of a person or household. Since debits and credits are associated differently with each particular sort of individual account, an important aspect of simplification for domestic accounting is to be able to distinguish between the purposes of each account and its relationship to all the other individual accounts in the chart of accounts. This inter-relationship has three important features which when resolved, will ensure that just by looking at any account name, it will be easy to know everything about that account - and therefore how it relates to any other account and how it may participate in double entry postings. a Liability type account where a positive (increase) implies more debt or liability and less value, a credit entry, whilst a negative value implies less debt or liability and more value, a debit entry. Domestic Asset accounts : The use of an Asset Type account to store true domestic assets, such as cash, a house, a car, an investment, etc. Domestic Liability accounts : The use of a Liability Type account to store true domestic liabilities, such as a mortgage, a car loan or credit card balance. Domestic Quasi-Liability accounts : The use of accounts mostly of the Liability type used to store Domestic Wealth (equivalent to business equity, owner's or capital value) and changes associated with increases or decreases to Domestic Wealth. Domestic Working accounts: Special accounts used to mediate certain transactions, such as asset acquisitions and disposals, appreciation, depreciation, etc. All DWBA account names are pre-fixed with a two-character group. 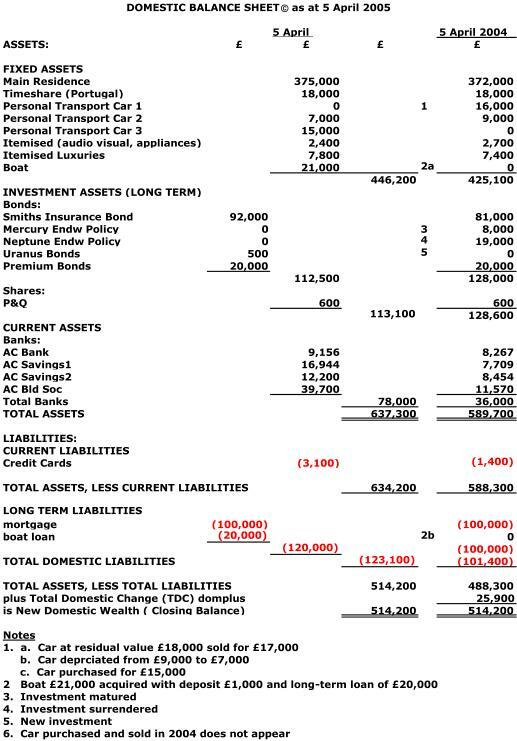 Here is a Trial Balance (an edited example below, from the set of two year's worth of accounts). This shows the balances on a particular date of all the individual accounts for the current and previous year in a set of domestic accounts; the account names with their two-character prefixes highlight their type and usage. Note that the 'AW Categorized Decreases' account in this version is now 'AQ Categorized Decreases' in later versions. Assets - Liabilities = (Shareholders or Owners equity). Thinking about it, the value of domestic wealth represented by the assets less the debts, is owed to the eventual beneficiaries of the household or individual’s estate. The executors have to pay off the debts from the assets and what is left, the Domestic Wealth, will be shared out amongst the beneficiaries - so the domestic wealth is a sort of liability from the viewpoint of the entity represented by the accounts. The domestic wealth is owed to the beneficiaries and therefore should logically, reside in a liability type account. So that is why quasi-liability accounts are defined to be used to hold the Domestic Wealth; compared to true liabilities held in LC and LL accounts, which can be considered as 'bad' liabilities. Domestic Wealth is a 'good' liability and so the set of quasi-liability accounts in DWBA signifies good liabilities - the more the better! Considering changes over some period, increases from salary or growth imply more wealth so logically, should be stored in some sort of LQ account; conversely, decreases resulting from expenses such as food, drink, hobbies and holidays, as well as depreciation and losses, should logically (accounting rules) be stored in an asset type account. The accumulating decreases are a sort of 'bad' asset because they detract from assets available to fund true debts and similarly to 'good' liabilities, should therefore most appropriately be stored in a new style, quasi-asset account (AQ). In order to assist understanding of double entry postings, mathematics state that an equation must be kept in balance by having any addition or reduction in an account on one side of the equation, balanced by an equal addition or reduction in an account on the other side of the equation, respectively. Alternatively, any increase in an account on one side must be balanced by an equal decrease in some other account on the same side of the equation. The accounting rule states that a credit entry must always be balanced by a debit entry and so with a little pencil and paper doodling, it is easy to see when these two rules are combined, an increase on the asset side requiring a compensating increase on the liability side must equate to a debit entry (increase in an asset) and a credit entry (increase in a liability). Similarly for two entries on the asset side of the equation, a debit (increase in an asset) will be matched by a credit (decrease in an asset) or, for two entries on the liabilities side, a debit (decrease in a liability) will be matched by a credit (increase in a liability). The last main area of potential difficulty for non-accountants relates to usage of the two main columns in each individual account. There is normally one column for additions and a second column for subtractions; there will often be a third column showing a running balance of the overall effect to-date, of all the previous entries as any combination of additions and subtractions. Traditionally, debits (Dr.) were always stored in the left column of an account and credits (Cr. ), in the right. The implication here is that positive increases in asset type accounts will be entered in the left column whilst for liability type accounts, regardless of their actual usage, positive entries being credits, will be entered in the right column. Particularly with off-the-shelf personal accounting packages, the traditional rule is not always adhered to and not only will the column headings, debit and credit, not always be seen, but regardless of the actual headings adopted, the traditional positive and negative alignment to columns will not always be maintained. This can be resolved in practice with a number of simple rhyming memory joggers. Bookkeeping is concerned with initially setting up the appropriate accounts and subsequently making entries into the accounts in line with the actual financial transactions taking place from day-to-day. Bookkeeping also has to take care of the end-of-period administration involving re-setting the working and increases and decreases accounts to derive the new value for Domestic Wealth. For setting up the accounts, there are two distinct ways of capturing DWB depending upon the architecture of the particular accounting software package used – support for categories or for the nominal accounts used in business for storing income and expenses. For the Financial Results, the business Trading and Profit & Loss accounts are replaced with a “Domestic Changes" (LQ DC) account. The Capital account is now called the Domestic Wealth (LQ DW) account and alongside the personal debts or liabilities, represents an overall liability as the ‘Estate’ of the account owners, owed to all the eventual beneficiaries who will one day, inherit from the estate. A new report called the Domestic Well-Being Statement (DWBS), replacing the business Trading and Profit & Loss accounts, shows the breakdown by DWB categories and sub-categories for all increases and decreases over any period, resulting in the Total Domestic Change (TDC) over that period. The Domestic Well-Being Statement summarizing increases and decreases is based on the Domestic Changes account. The overall Total Domestic Change is transferred to the DBS, analogous to Gross and Net Profit in business being transferred to the Balance Sheet. Following an analysis of recent and past results and in the light of future plans, once decisions are made on the need for future changes, perhaps to the overall balance amongst the DWB categories or to the values for any of those new domestic financial factors, these can be translated into amounts of individual sub-category monthly changes needed over any desired future period – typically a year. Budgets can be prepared that will help to provide automatic warnings as actual changes in the different, selected category or sub-categories, approach any pre-set limits on perhaps, a monthly basis. The idea of improved or maximum Domestic Well-Being is all about achieving a better balance across the components of its structure. This translates into obtaining the best usage of increases received as income, with decreases across both the categories of 'Essentials' and the 'Nice-to-Haves', as well as between the various subordinate sub-categories within each category. The new focus and target for domestic finances and accounting is to maximize Domestic Well-Being, in contrast to maximizing business profits. The analysis, once figures have been produced at the end of some period should first look at distribution and balance. Are the proportions for example, being spent on the Basics, a fair amount compared to the Total Increases? The information obtained from the end-year results, should reveal some fundamental facts. Has it been possible to afford anything, over and above the basics? If the answer to that is positive, did the amounts enable a reasonable allocation to discretionary decreases, and what about luxuries? At the next category level down, what does the distribution look like within the basics, and within the discretionary category? For the basics, is there a reasonable distribution between 'essentials', 'responsibilities' and 'local-to-family' concerns? The accounts and the new accounting methods will together provide the data and information needed to pick up warnings. What sort of warnings might be of interest? In the climate of a debt crisis, probably the most important warning required, would be one relating to the likelihood of such a pending crisis for the account owners. They would want to know if their decreases are getting too close to their increases, or even exceeding them. They would want to know if their reserves are being depleted, possibly on funding any excess of decreases over increases. They should be looking to see the amount of short-term and long-term liabilities on hand, to see how they compare to the previous year's figures; and how their proportions compare to the total value of assets (contained in one of the new, secondary domestic financial factors). They would want to know about their liquidity; how well are they able to realize funds in the short term to meet their known commitments. They obviously do not want to sell their car or house just to pay the bills. On a less dramatic but much more important note, it is appropriate to know about the proportion of contributions being made to 'future well-being'; and if positive, does the amount being put aside represent a reasonable proportion of the increases? The 'responsibilities' subcategory, under the basic decreases category is important and so it will be crucial to guard against any indications of potential difficulties in this area. In relation to well-being and some of the perhaps, less significant aspects of contributions to improving domestic well-being, warnings in this area would be pertinent. Rather than alarm-bells, a conscious decision once in a while to look at decreases occurring in the sub-categories of 'Nice-to-Have' would do no harm. Check to see if reasonable, affordable and balanced expenditure in these areas are being made, such as on 'holidays', 'entertainment', 'leisure' and 'hobbies'. Apart from warnings, any changes that break the past patterns of domestic increases and decreases must be detected and verified. Detection simply involves a quick, manual scan down the results of the formal reports - the DWBS, and DBS - for anything unusual, particularly compared to the previous years. Anything detected that is unusual requires further analysis, with perhaps, comparisons with figures further back in time or detailed checking in the accounts themselves. With experience, account details can be examined from so many different perspectives in the accounts, such as the categories, payees and budget views, as well as from the results of the various reports and supporting graphics obtained directly from the accounts. Domestic Well-Being Accounting has been implemented on at least two different accounting software packages - Microsoft Money© and Personal Accountz©. These products have somewhat different architectures and so their implementation has to be adapted accordingly. Microsoft Money© is a single entry system by design with the ability to create accounts of different types, as needed. Its column headings and alignment are not in the traditional debit and credit order but uses, so-called income and expense columns in the opposite order to debit and credit. The package can be used for double entry accounting by simply creating the extra accounts associated with domestic wealth, as needed. Microsoft Money© does not have a double entry style, journal-entry capability whereby a single transaction can be associated with the two appropriate accounts required to maintain the required double entry balance. It does however have a category tagging capability whereby each entry into the accounts can be associated with a user-defined tag. This capability has been adapted to accommodate DWBA by establishing an indexed tag structure to match the DWB category structure. With this, every entry into the accounts can be tagged at original entry time to the appropriate DWB structure element to achieve the first half of the double entry process. This becomes a very easy process as virtually every transaction entered is simply a repeat of some previously entered transaction. At the end of a period, a simple query by date and categories can retrieve the two totals of all the increases and decreases entered during the period. Two further entries into the accounts, one for the total of the increases and another for the total of the decreases, results in the complete double entry balance being restored. Personal Accountz© has a traditional double entry architecture but is not tied to business account names and reports. Accordingly, it is possible to define a set of (nominal) accounts to match the DWB structure so that double entry is easily achieved through the product's journal style transaction-entry screens. With an appropriate arrangement of accounts, it is possible to dynamically see the Domestic Balance Sheet and Domestic Well-Being Statement, as up-to-date as the last transaction entry made. With the easy availability of PCs and appropriate software accounting packages, it has now become theoretically possible for anyone to try using accounting to support the management and control of their personal or domestic finances. Until the development of an appropriate accounting model, it wasn't actually very easy to do - all because of an inappropriate focus and unsuitable products in the relatively well-known business accounting system; and the difficulty for non-accountants to understand the terminology and techniques associated with doing business-style accounting. The Domestic Well-Being accounting model resolves these issues by first, defining a new focus for personal accounting based on the nature of the financial transactions characterizing normal domestic life. From this, products such as reports, ratios and charts tailored to the analysis needed to control finances can easily be produced. By aiming to achieve control of personal finances by maximizing domestic well-being rather than profits, it becomes possible to relate the management and control of personal finances to the realities of life and the everyday aspirations of people at large. Secondly, the practical techniques of undertaking accounting in a home environment are simplified by a range of measures to aid understanding and to facilitate the practical accounting activities of bookkeeping, reporting, analysis and the subsequent budgeting and monitoring of future results. In times of financial difficulty, under the cloud of the debt crisis, the credit crunch and ever-increasing prices, the control of personal finances deserves more attention than it appears to receive. In a recent ’Axa survey’, one of the many telling quotes was "One of the biggest issues, however, is that many seemingly well-off households lack the motivation to tackle their problems". Doing accounting certainly demands a sense of responsibility and some motivation but now, it is really not all that difficult. Maybe with this financial turmoil and available methods, it is time for householders to investigate and learn more about it? Visit the DWBA Home Page at www.sassybooks.com and the Matador imprint of Troubador Publishers Ltd. The sample products show reports, factors/ratios and graphs taken from a complete year's worth of sample accounts. As such, they illustrate the essential features of the Domestic Well-Being accounting model, in terms of its chart of accounts and its focus on Total Domestic Change resulting from the formal structure of the domestic transactions from which it is derived. The trial balance shows a complete list of all the accounts required to support the DWB accounting model. In particular, note the account name prefixes which identify for each account, the overarching account type and account category, qualifying its particular and unique name. As in all double entry accounts, it is expected that the sum of all the asset type accounts should equal the sum of all the liability type accounts. The trial balance is therefore the starting point for validating the correctness of all the transaction entries made as part of bookkeeping. The DWBS shows all the transactions accumulated over some defined period that have contributed to Total Domestic Change. The categorized structure of all the transactions in terms of their increases and decreases provide the basis for the analysis that facilitates future control through maximizing DWB. The Domestic Balance Sheet is very similar to a business Balance Sheet with the essential difference that the net profit brought down from the business Profit & Loss account is replaced by the Total Domestic Change brought down from the DWBS. It summarizes the financial situation of a household on a particular day at the end of a period with all the true assets and liabilities identified together with TDC, leading to the derivation of the new value of Domestic Wealth. The DFF are domestic versions of business financial ratios. They are derived from elements of DWB to be used in support of financial analysis in order to help achieve control of future financial activity. An example of one way of depicting groups of DFF values in terms of ‘shape’. This star or radar style chart can be used in support of financial analysis for control, in relation to the associated DWBA Stages of Domestic Financial Life. One way to depict changes in a particular domestic financial factor, in terms of income and family size. A graphical chart showing an analysis of the DWB components of one sub-category – Basic Domestic Decreases, by all its lower sub-categories, over two financial years. The figures show the actual currency amounts. For each of two financial years, this chart shows the components of income, expenditure, Total Domestic Change with its cash contributions, by Basic, Discretionary and the Other, top-level DWB categories. This chart summarizes the amounts of the DWB lower level categories for the Utilities sub-category of Basics/Essentials, for one financial year.